Man, another busy day here, but a good one. 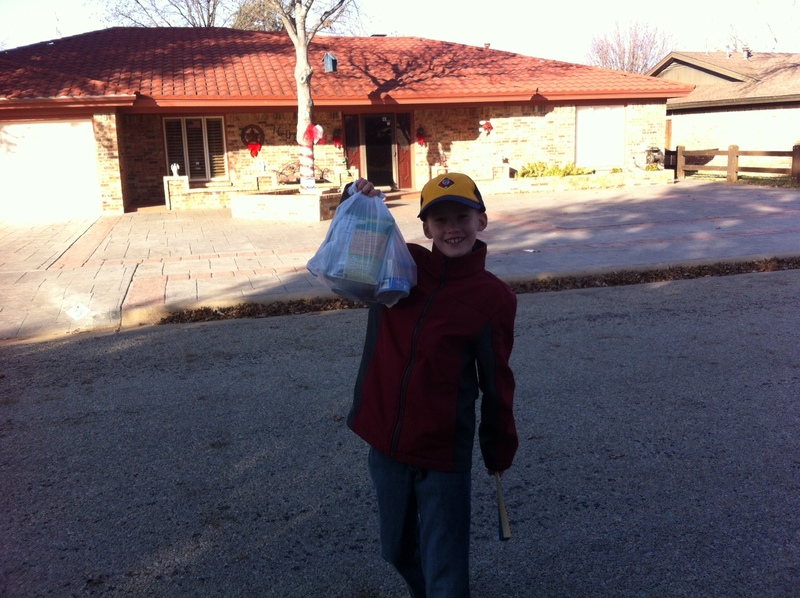 Blake's cub scout pack put out fliers during their Monday meeting for the annual Scouting for Food canned food drive. I took him back through the neighborhood that he papered on Monday, and we picked up the sacks of food that people had left out. Actually, about the first half of the neighborhood hadn't left out any sacks, and Blake grew more and more incensed as we walked down the street: "Daddy! Do people not know that there are other people who are hungry?!?" Fortunately, the second half of the neighborhood was much more productive, and he was much more happy. That thing in his left hand is a paper Chinese fan. I wondered why he had picked it up on a morning when it was forty degrees outside, but soon figured out that he planned to use it to signal me while I drove. He had this whole little set of movements to tell me whether I should slow down, speed up, or stop. It was like watching one of those dudes on the runway of an airport, only more adorable. After we dropped off the food, I took the kids to Holland Gardens for a while to look at all the trees and decorations. 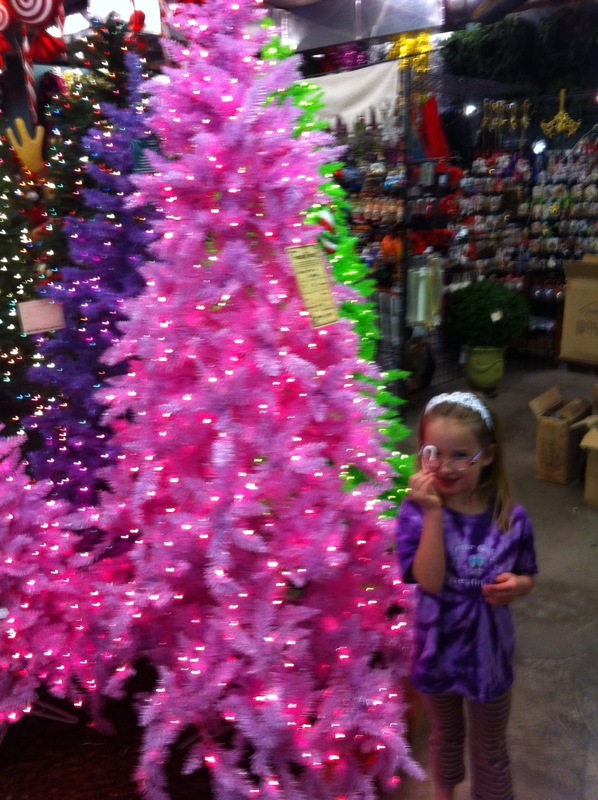 Ava felt strongly that we should get the pink tree with the pink lights. 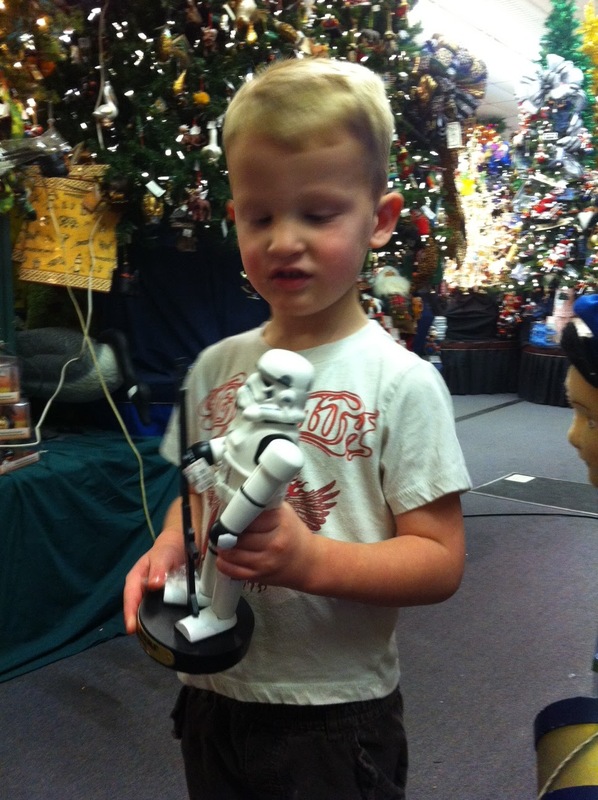 Jack was into the Storm Trooper nutcracker. After the store and a little lunch, I took Blake with me to the Science Spectrum, Lubbock's top-notch children's science museum. My kids are big fans of the Science Spectrum; we've had a membership for the last few years, and they never, ever get tired of going there. To tell the truth, I almost never do, either. 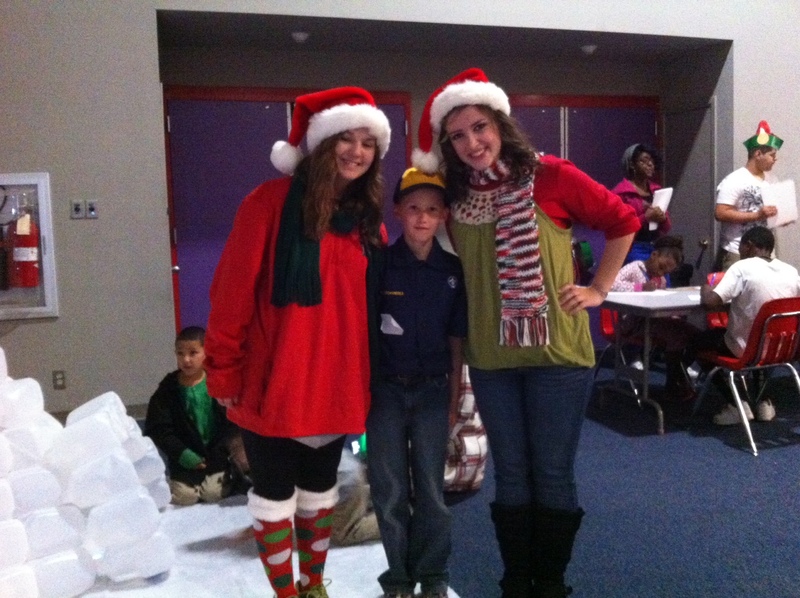 Today was their Holiday Wonderland event, which was open to the public. 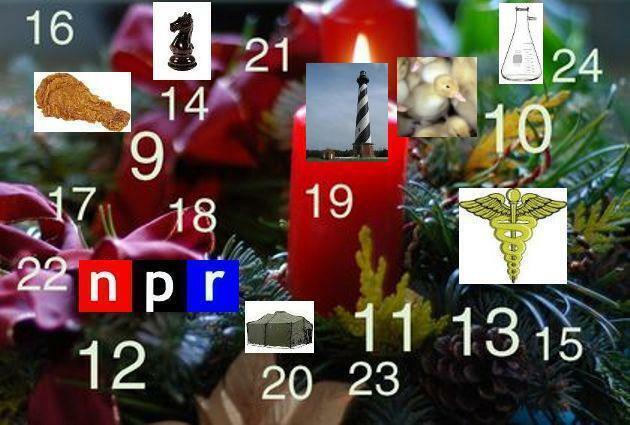 It's a neat mix of fun crafts and activities, as well as some winter-related science projects. 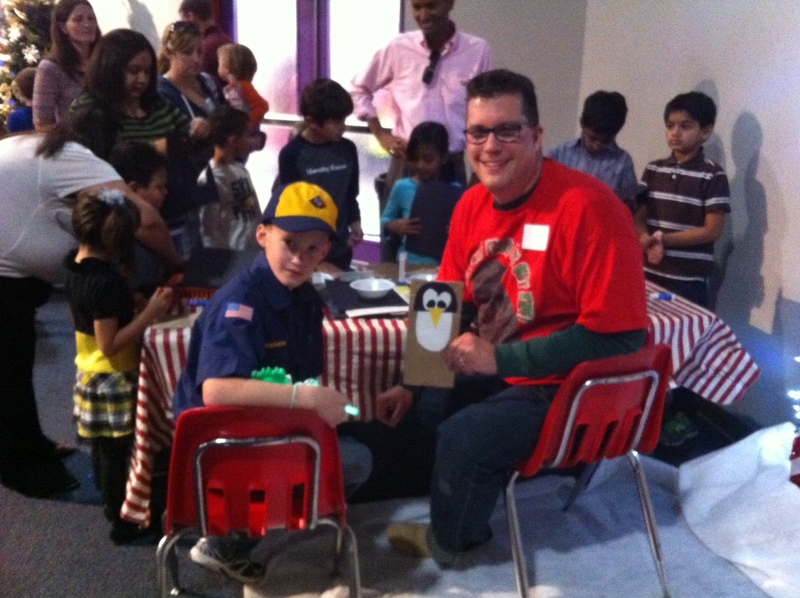 Blake and I were asked to man a table where children could make reindeer or penguin sack puppets. It was fun! He got a little restless, though. Right behind us, there was a projector set up playing videos of Christmas music, and kids would come by and dance. I don't know where Blake gets it, because it's sure not from me and Courtney, but he's got some seriously impressive moves. How good? Good enough that these two girls asked if I'd take their picture with him. Affirmation Project: My manager Randy is also a dad, of two kids close to my kids' age. Maybe that's why he's always so understanding when I need a little flexibility to do something with my family. He's patient and encouraging to me, and makes Vista Bank a better place to work. I can't be a smart alec on this one. You and Courtney are doing an amazing job raising an amazing person in Blake (the hound dog! ).